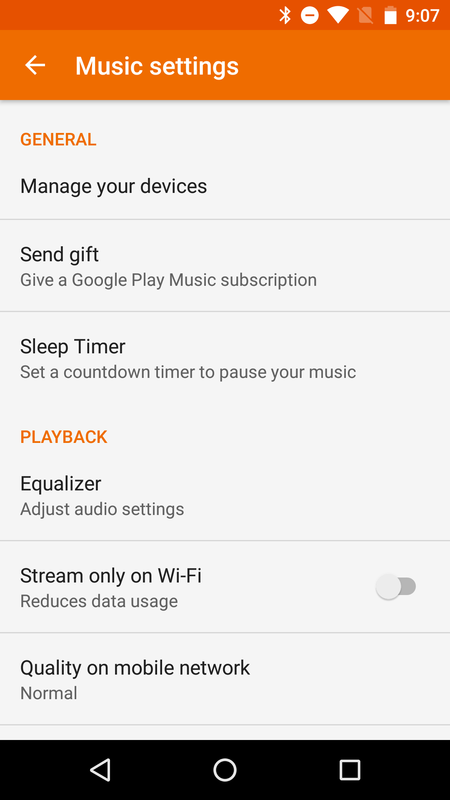 If you've been looking forward to the day Play Music gained a sleep timer, your wait is over. A teardown in mid-July let us know an auto-pausing feature would eventually make its way into the app, but it's version 6.13 that makes it a reality. 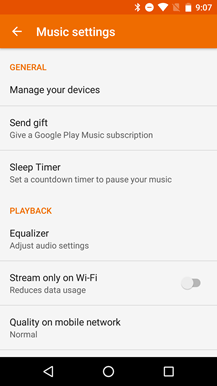 If you want to fire up the sleep timer, you'll have to start at the Settings screen. It has been unceremoniously buried at the bottom of the General group where it's unlikely to be seen by most people. 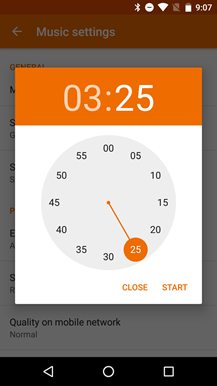 Starting the sleep timer will open a quirky new variant of a time picker. It's not completely unfamiliar, but it's just different enough to be a bit unintuitive at first glance. 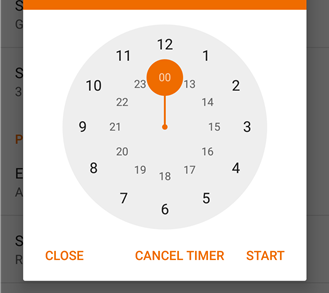 You'll begin by picking hours on a dual-ring 24-hour clock. 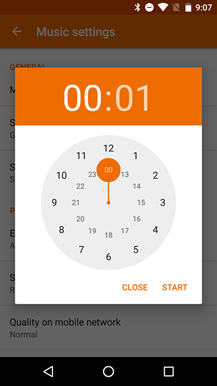 You can drag the handle or tap on any hour, but as soon as your finger comes off the screen, it will switch to a standard face for picking minutes. On this screen, you can tap or drag for individual minutes, but the timer won't begin until you hit the Start button. If the somewhat unpredictable nature of the first time picker screen doesn't catch some people off guard, they might be thrown off by the fact that they just entered a duration rather than a stop time. 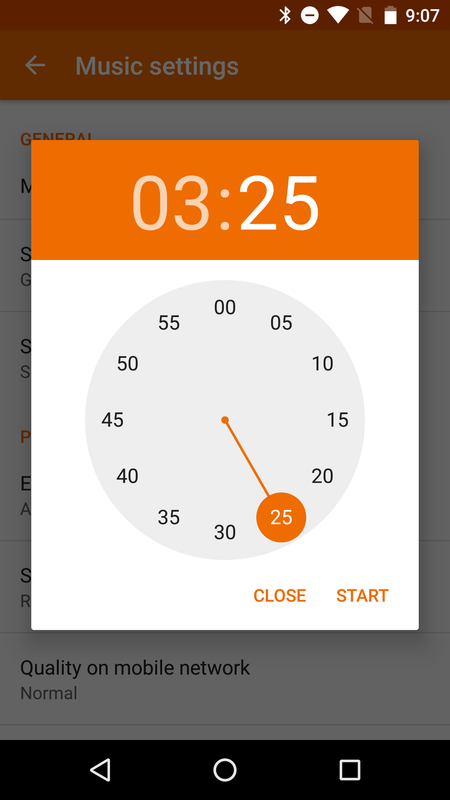 In other words, if you thought you had picked 10:00 PM at night (22:00) on that 24-hour clock, you would be mistaken. That timer will actually run for just over 20 hours. The best clue you'll get about this comes after setting the timer, at which point the text on the Settings screen will give the remaining time. Once the timer is going, it can be changed by tapping the sleep timer line and restarting the process, or stopped by tapping the new Cancel Timer button. When the timer is finished, music is paused immediately. 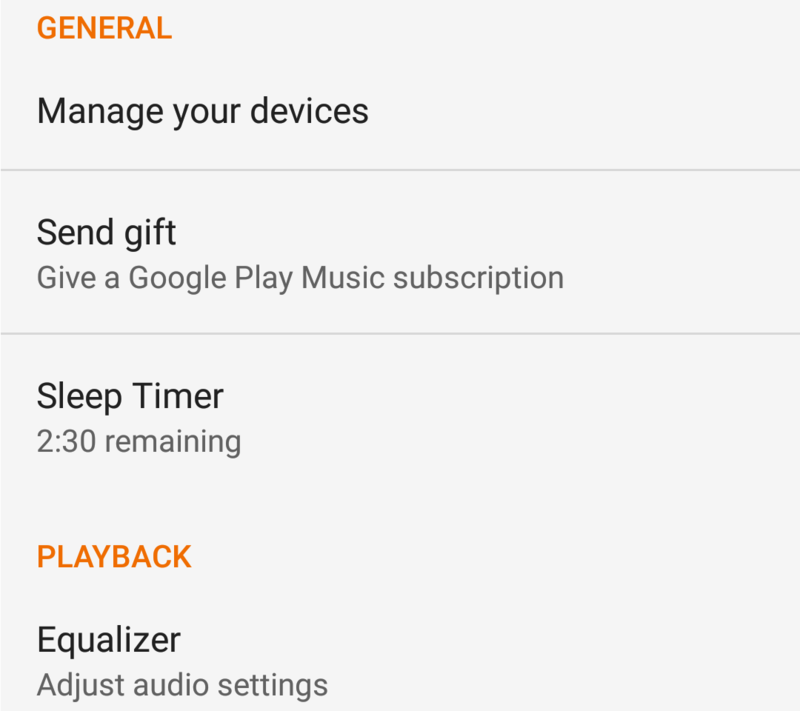 I don't mean to pick on the team responsible for Play Music, but I have a feeling the sleep timer might have been enabled before it was intended to be. There's no live display of the remaining time anywhere outside of the Settings screen, and when the timer runs out, it pauses the music with no visual hint to show it was because of the timer. These things make it feel unfinished. It's hard to predict how much a sleep timer will be used, but I would have thought it belongs in a more accessible location. The Settings screen isn't the most convenient place for it, especially if some people intend to use it frequently. Earlier this month, I posted a Tiny Teardown from the v6.12 update to point out that there was new evidence to suggest Play Music would soon support Samsung's Galaxy Edge phones. Nothing was showing up on those phones yet, and this version doesn't change that, but there has been a little more motion. Since this didn't reach an official post last time, it's worth quickly mentioning now. My previous post covered most of the directly accessible features, including player controls and on-screen information, starting music with I'm Feeling Lucky, and other standard components familiar to Play Music. Some new layouts and entries to the AndroidManifest show that there will also be "recommendations" for music based on your taste. Yeah, this really isn't too exciting; but if you're the owner of an Edge phone and excited to see at least one app taking advantage of the feature that makes it unique, you'll probably appreciate knowing that there has been progress. While Android Wear is reasonably capable of starting playlists, radio stations, and podcasts, it looks like Google is going to attempt smarter options based on context. The new option, perhaps the first of many, is going to suggest "Music for fitness" when users are believed to be working out. 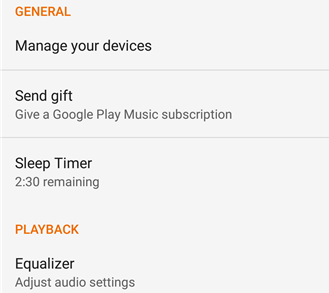 This will probably be no different than the workout radio stations already found in Play Music, but the important difference is that it's a dedicated option right on a watch. If you're stuck starting a workout without music playing, this might be a convenient way to get it started without reaching for the phone or fiddling with a lot of navigation on the watch.